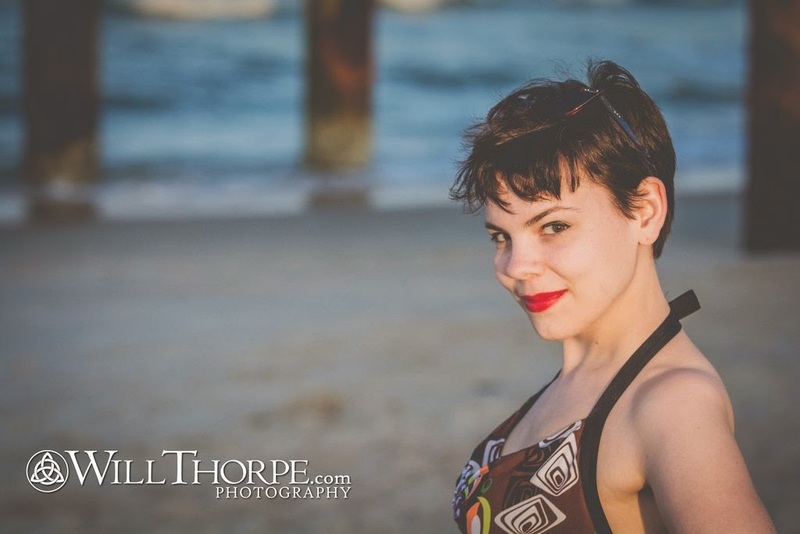 I couldn't go to the Florida coast without getting some shots on the beach! 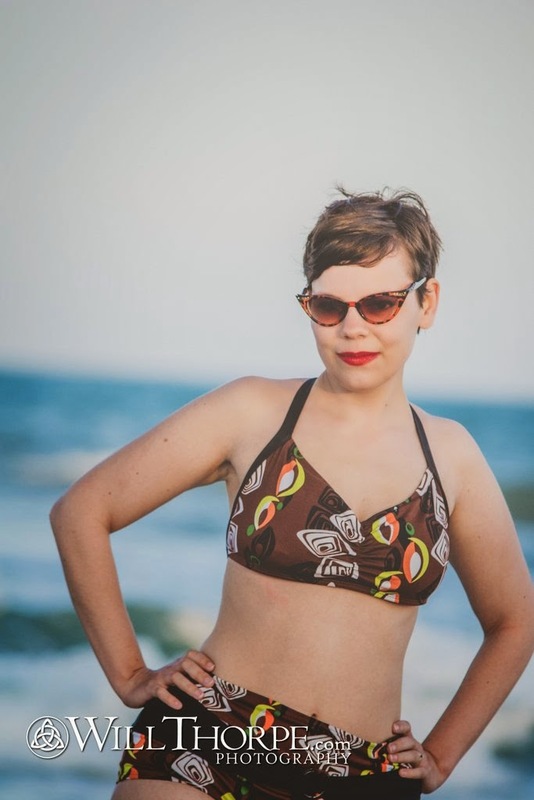 And I already had a great retro swim suit so off we went! Warning! Photo heavy post ahead! The swim suit is from Fables by Barrie. I purchased this suit back in 2012 for my last visit to Disney but it hasn't gotten much wear since. It features a great midcentury print! And the high waisted bottoms have a cute belt detail! We chose this beach for the great pier! It was so fun to shoot with! 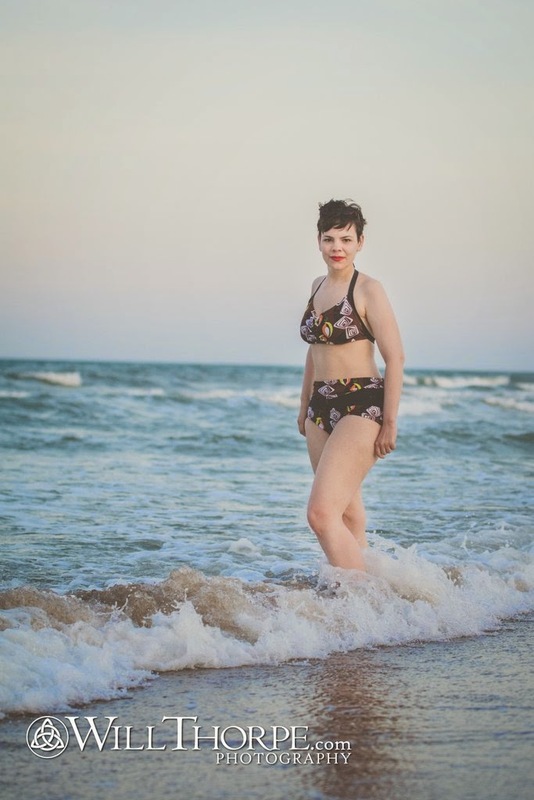 I'm not generally super excited about showing off this much skin on my blog but I've been working on posing and it really helps my self confidence to know how to stand to show my body in it's best light. And I have reason to believe that I'll be wearing this suit a lot more often in the future. Part of the reason for the trip was to do a moving scope out of the area we thought we'd like to move to and we're going to do it! We won't be moving till the end of the year but I will be downsizing a lot of my vintage wardrobe in preparation for moving out of state so expect more wardrobe sales on the blog over the next few months. Are any of you currently in or from Florida? How fun! My husband has family in Florida too! You look awesome & lovely in that suit, Stephanie. Congrats on the move! But what are you going to do about your knitting habit?! :-P And your adorable tweed cape! Oh gods, so much vintage is winter wear! I know! But I figure that once I get accustomed to Florida weather, those 50F days will so call for a sweater or stylish cape! What fun about the move! A few winter items will still be in order. I have lots of family down there and it does freeze once in a while! ;) Enjoy! you look amazing! that pier in the setting sun is just beautiful. i've never seen the ocean in my life, so i envy your experience greatly. how awesome is it that you're moving! can't wait to follow along. i suspect you'll have a lot of fun in the next year! 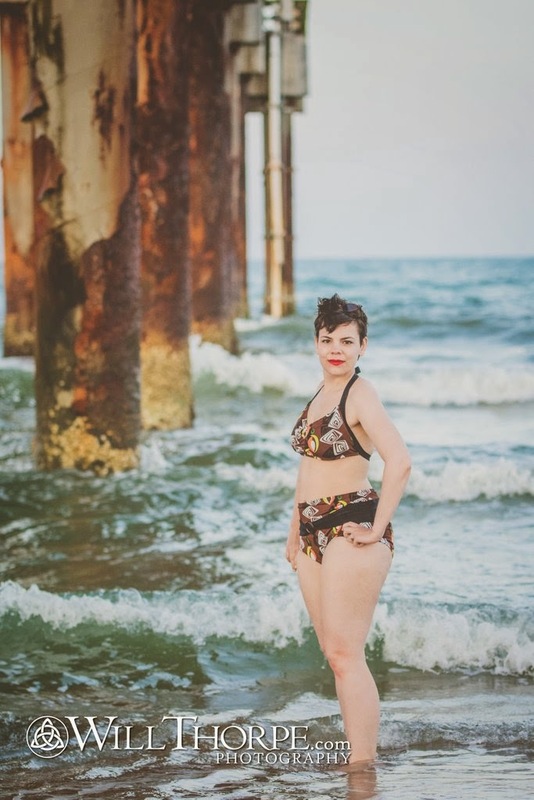 I feel so unbelievably self-conscious in a swim suit it's one of my demons I've yet to face. You look incredibly cute, Stephanie! Tis true! Winter here IS rough, since they are worse here than Northern California!! My hubby and I are huge Disney nerds too so that is definitely a plus! Awesome shoot! 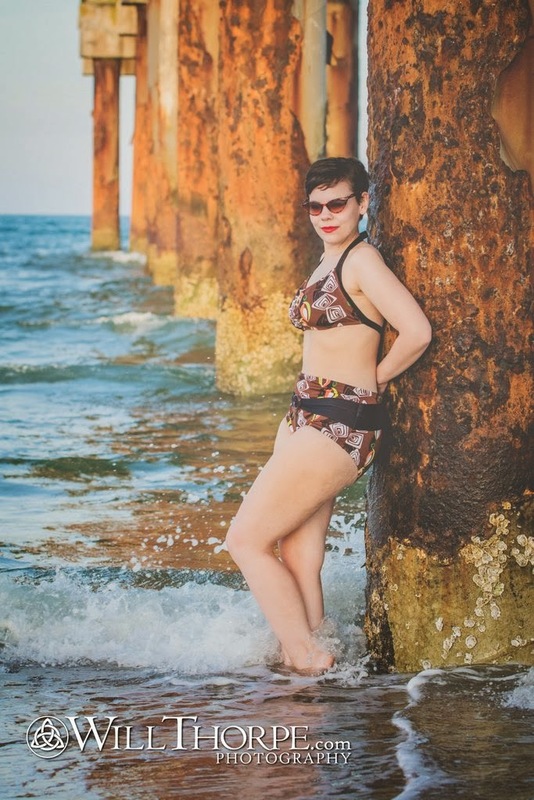 I love the diversity of poses and also your wonderful swimsuit! The cut is uber flattering and the pattern channels the 50s so splendidly. These are some seriously cool, memorable photos you two have captured and shared with us. You look fantastic!!! I'm so excited for you guys for the move! Pj and I honeymooned in St Augustine and it was an amazing time, beautiful city. I hope we an go back some day. It would be amazing to move there!! St. Augustine is fabulous! We're actually moving to a town called Melbourne which is further south but St. Augustine will be within reasonable driving distance so I see many trips there! AHHH! So jealous! I love Florida. You are a super bombshell in that suit. Hey there, I live in Miami (which is about far south as you can get in FL without leaving the main land. Melbourne is bout 2 hors north of Miami. I'm a northerner (NY) transplanted to Miami (partner's work brought us here--he's a professor at FIU) and all I can say is I do NOT miss the winter at all! This past winter was especially brutal in upstate NY--while my family was battling bitter cold and mile high drifts, I was wearing shorts. I will say that northern FL gets cold (my sister lives on the panhandle--when we visited her over Christmas, I required a jacket and socks). I'm sure you'll be making friends of your own and doing cool stuff, but if you're ever in Miami, please let me know--I'll gladly show you around! Also--Pinned Miami. Look it up. Awesome! I know the Renaissance Festival is down by Miami so I'm sure we'll be down some time! I've actually been to Florida more in the winter than the summer so I won't be pitching out all of my winter wear in the move but I can't say I'll miss having a real winter either!